Actually? not bad. Great effects and action, great editing and direction (from, surprisingly, Brad Bird, who directed things like The Incredibles and Ratatouille) and I can’t say I was bored at any one moment throughout. Everything was exciting (especially that climbing the Burj Khalifa scene, that was supposedly done with no stunt double) and despite the 2 hour 18 minute length, it did not feel like it was at any point being stretched. 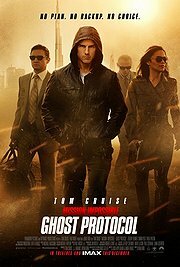 Of course, Cruise is hard to take serious these days, especially with his character’s blatant ‘we’ll do what’s right despite what others think’ attitude, but overall the whole ‘over-the-topness’ of it all fits nicely in the Mission Impossible universe. So what if they ‘break into the Kremlin’ or disarm a nuclear missile seconds before it hits its target by pressing a big red button (a thing that even the characters in the film can’t resist to joke about after the fact). Really it is just a throwback to the good old '90s action/spy movies, where it doesn’t need to take itself too seriously to be successful. Overall, surprisingly enjoyable, despite the Cruise, except for maybe the last bit that seemed somewhat out of place and almost stalkerish. Still, worth it in IMAX.